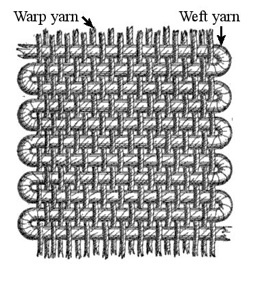 Now that you've built your frame loom you need to warp the loom before you can begin to weave. Warping is the process of putting yarn on the loom from top to bottom. Loop the thread under and over the top cross-piece and bring it down to the bottom and do the same. The warp thread should be kept tight but not so tight that you can't lift the warps up with one finger. Continue looping around the top and the bottom cross-pieces making a figure eight pattern each time you go up and back. When you have around 20 or so loops, you can make more or fewer if you like, tie the warp thread off at the top cross-piece. That was quick! Next, we’re ready to weave on the frame loom. First, take a very long piece of thread, wool is good or thick cotton, and tie one end in a double knot around the bottom cross-piece of the loom. I’ve also found several other interesting materials to use as warp. Magnetic tape, either from old cassette tapes or ideally old reals of computer tape, can make a very interesting warp thread. First take one end of the tape and tie it to something fixed, like a door handle. Then real out a length of tape and start to pull on it. The tape will curl in on itself as it stretches. With practice you can stretch the tape to a point just before it breaks. This can then be your warp thread. Experiment with other materials. There are no rules, and no one can tell you that you’re doing it wrong!